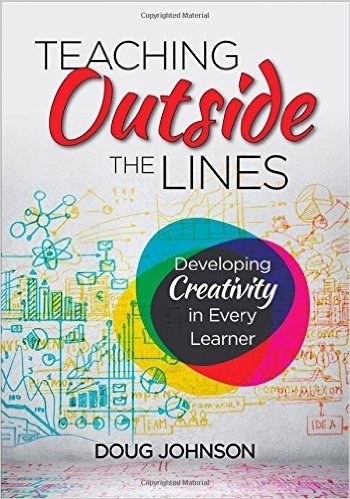 Teaching Outside the Lines: Developing Creativity in Every Learner by Doug Johnson encourages teachers to believe that all students can be creative and gives specific advice for how to allow for it in schools. Be sure to get one for every teacher you know. Why do educators not only fail to encourage creativity, but also seemingly discourage it? If you agree with Doug you see creativity as important in education as literacy. While we accept creativity in art class and on the athletic field, we discourage it with stay-within-the-lines rules, one-right-answer tests, praise for conformity, and using tests to judge school and teacher effectiveness. Teachers often see that creativity has no roll in core subjects. It’s also important to realize the creativity without skills, knowledge, discipline, hard work, and practice isn’t worth much. Doug also sees that just like there are multiple types of intelligence, there are also multiple types of creativity. And don’t think that just using technology allows for creativity. Creative people can make others nervous or upset, which explains why it is often discouraged in schools. If problem solving is important, we need to realize that higher levels of problem solving give creativity full reign. 1. The Rise of the Creative Classroom: Why is Creativity No Longer a Nice Extra in Education? Creativity may be the only way people can stay employed in good jobs in a postindustrial, automated, global economy. Jobs that require complex communication and expert thinking have increased since 1969. Since then jobs featuring routine cognitive or manual work have been decreasing. If machines or people in developing nations can do a job, they soon will. A poll of 1,500 CEOs identified creativity as the number one leadership competency for the future. It’s not hard to find creativity in the standards promoted by many organizations, but studies show that schools in the US have not succeeded in fostering creativity. In fact, they are doing just the opposite. The obvious culprit, of course, is our obsession with testing. 2. I Can’t Define It, But I Know It When I See It: What is Creativity Anyway? After looking at many definitions, Doug sees that creativity has an element of the new, the innovative, the original, and something not yet done or done in a new way. Definitions also include the notion that creativity adds value to the task or objective to which it’s applied. Craftsmanship is also essential. That is why it is important for schools to also work on skills and knowledge acquisition. Craftsmanships is what separates scribbles from art and cacophony from music. As craftsmanship gets stronger, the creative process is enhanced. This entry was posted on Tuesday, July 4th, 2017 at 6:50 am	and is filed under Book Summaries, Education Books, Leadership Books. You can follow any responses to this entry through the RSS 2.0 feed. You can leave a response, or trackback from your own site.